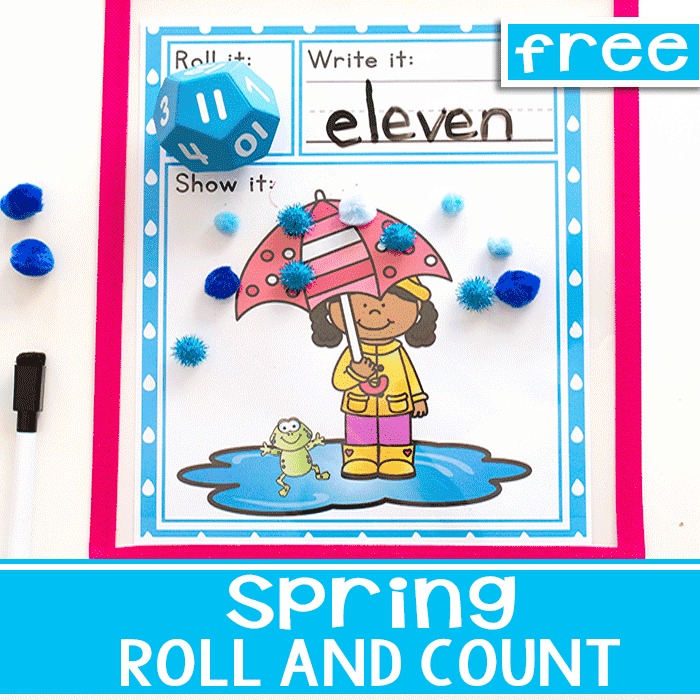 Kids will love playing this fun spring math game to help learn and practice counting. Spring is typically thought of as the warm sun after a long, cold winter. Which it is, and I love spring for that exact reason. Especially after the last couple of winters we’ve had in the Midwest, which have been incredibly cold. Spring sunshine is much welcomed. As much as I like the sun, though, I also love a good spring rain storm. It is relaxing to open my windows, sit down to read a good book or play a game with my kids with the rain pouring down. Don’t forget about the wonderful smell that this rain creates, it’s like no other. 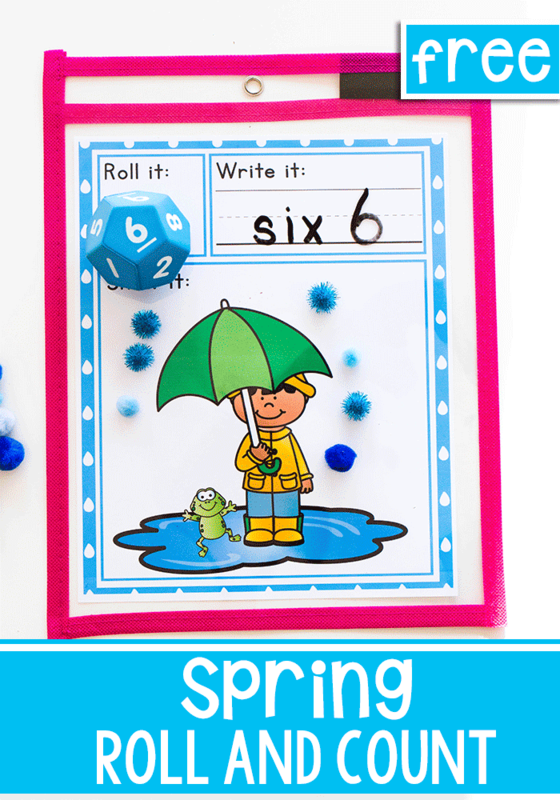 This is the inspiration for this fun Spring Rain counting math game! 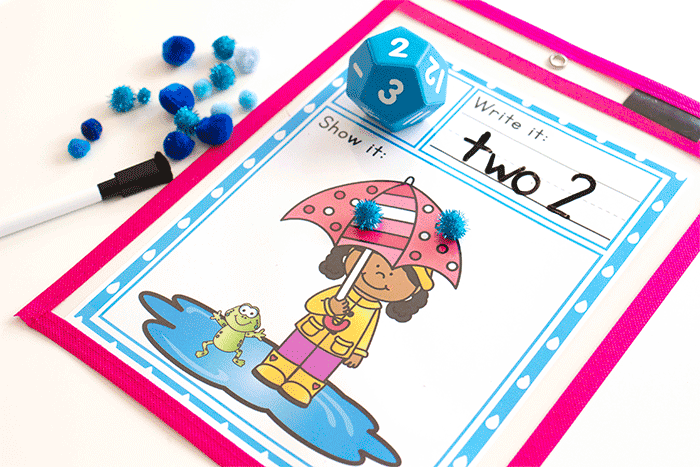 Kids love roll and count games because of the element of surprise. Each turn is a new number and it is up to the dice to determine what that number is. This keeps the excitement up for kids and keeps prep low for us. This game is not only fun, but it is perfect for helping kids understand and learn number sense. 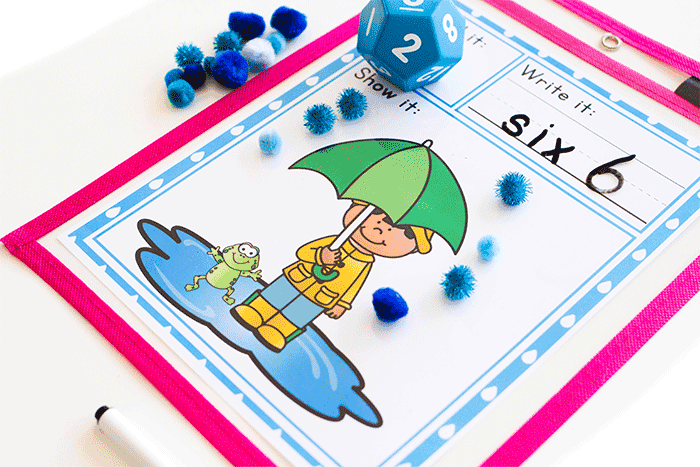 For kids who are just learning numbers, dice for 1-6 might be the best. 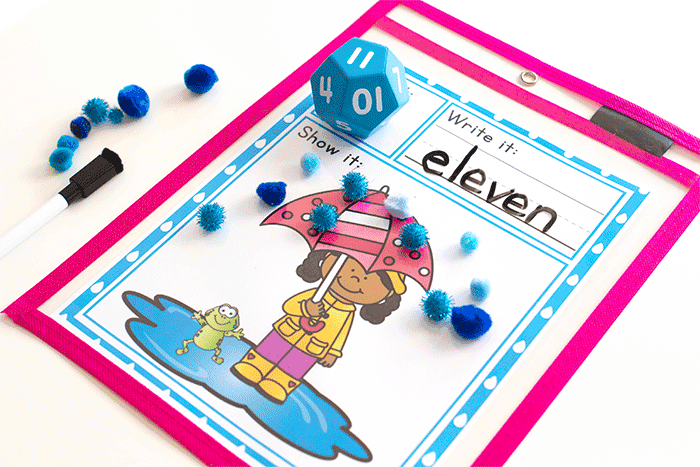 Where as children who are in need of more of a challenge, you can use the 1-12 or 1-20 dice. An alternative is to use giant foam dice. We love using these for math activities. They are fun to roll and I really like the quiet aspect of them. It keeps the distractions low for other kids. We also love using a double dice. This helps to simply create an addition activity or even a multiplication for older students. We suggest you either laminate the pages or do like we do and use these fun dry erase pockets. We love these for our Roll and Count activities because they can easily be switched in and out. It helps to save money in the long run. If I know my daughter is going to be completely obsessed with an activity, I will laminate it. These dry erase pouches make for a fabulous, easy alternative though. We have a lot of fun with these counting games. There are a variety of ways that this can be used, including using play dough, mini erasers, pom poms, or pretty vase fillers.